Before you start fixing up your home in order to sell it, talk with your realtor to find out which renovations will give you the most bang for your buck. How much work you need to do depends on many things: your home’s value, the current market, and other homes for sale in your neighborhood. Most buyers want to buy a home that has no visible, long-term maintenance required. Minor surface upgrades go a long way in getting more interest in your home, which can lead to a quicker sale. Weigh the cost of any proposed improvements against your home’s market value. Don’t forget to do your research! Here’s the latest cost versus value report for Indianapolis-area homeowners. Also, check out your competition. Before deciding to make a specific repair, visit open houses in your neighborhood to see what you’re up against. Replacing old carpet is the quickest—and least expensive!—way to give your home a new life. Keep buyers’ needs in mind, and choose a nice carpet with a high pile density in a neutral color that doesn’t compete with the color of your walls. Your best bet is a neutral shade of gray. Stay away from tan and beige. Learn more about 2018 carpet trends. Have more questions? Make the best decision about your investment in replacement carpeting with the Kermans carpet buyer’s guide. 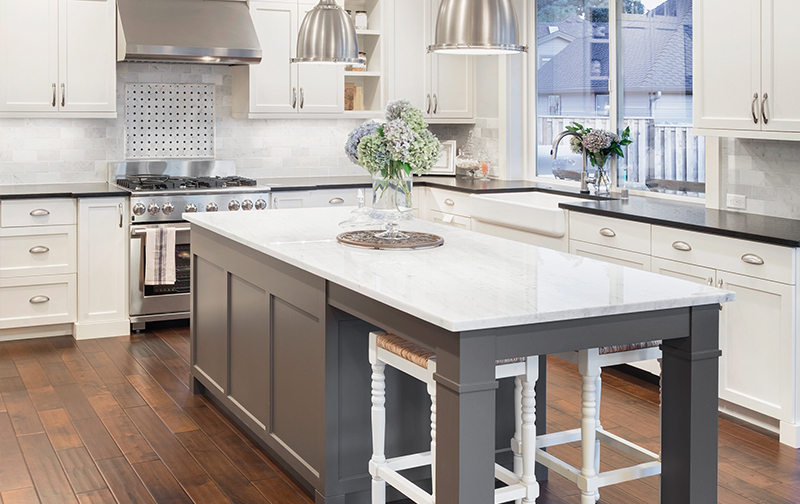 Win over buyers by modernizing your kitchen. A modern-looking kitchen is one of those things that buyers really love. Though a big expense, updated kitchens will increase the market value of your home. Check out comparable listings in your neighborhood and see what work you need to do to compete against other homes for sale in the area. Sometimes, updates as simple as replacing cabinet and drawer handles is enough to make your kitchen stand out and look new. Replace your kitchen flooring, too, if it is in bad shape. Consider resilient flooring because it is affordable, water- and stain-resistant. It convincingly mimics the appearance of tile and wood, and uses plank installation, which will give your kitchen a modern appearance. Have less money to spend? Think about adding an eye-catching glass tile back splash. This is a more affordable upgrade that appeals to many home buyers. Check to see if you have hardwood floors hidden under carpeting. This can be a big selling advantage. Many buyers today prefer natural hardwood flooring over carpeting, and it doesn’t take much to refinish old hardwood and make your floors look brand new. If you need hardwood flooring to compete, but don’t have this type of flooring in your home, consider an alternative solution that fits the market. Consider installing one of many high-quality wood laminate flooring materials to add value at a modest cost.